David Ford is IT Support Manager, and manages both the IT support and Computational Science teams, and takes an active role in both groups. David had a background in Mathematics and Computer science, before spending 10 years working in Computer Security and Incident response for two Universities, where he managed and built computer systems to handle the substantial network traffic datasets required to identify and analyse computer security incidents, including the development of toolsets used by multiple Universities to detect security incidents, and techniques to analyse high bandwidth network traffic using cost effective commodity hardware. During this time, he also worked closely with IT staff across the University of Oxford to enabled them to handle security incidents effectively. He still holds the record for the single person who has detected the most computer security incidents within the University. 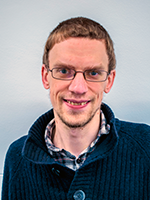 He has an MSc in Computational Science from the University of Manchester during which he investigated parallelisation of computational problems across non-identical computer systems. Since joining the school, in addition to managing these two teams, David has retained a focus on developing cost-effective solutions to meeting computational needs, including designing and implementing a substantial overhaul of the School's storage and computational infrastructure, increasing storage by over 1 order of magnitude and providing significant underlying infrastructure to enabled improvements to the range of computational facilities available to the school.